A Mississauga builder loan can be defined in a number of different ways, depending on who the builder is. For self build situations, the most common forms of builder loan is either through a bank or institutional lender where the building or construction loan and the long term mortgage that pays out the construction loan are both approved prior to construction, or a private mortgage construction loan. 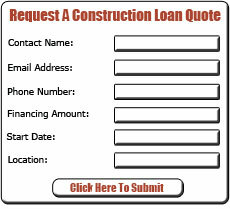 Of the two, the private mortgage builder loan option is most popular on single family construction projects, regardless of the builder due to the greater flexibility provided with a private mortgage including the ability to secure the long term take out mortgage after the construction project has gotten underway. For builders and developers, a builder loan is based on a combination of the fair value of the real estate before and after the completion of work that would increase the value of the property, and the presence of presales for units that will be sold off to third party buyers. The pre-sold inventory provides greater lending value when there are substantial deposits paid into trust and binding purchase agreements signed by all parties. In the absence of unit sales or pre-sales, the loan to value amount will decrease from as high as 85% down to 50% of the fair value of the property. The other main challenge with builder loans is getting funds advanced against the costs incurred in your project. Draw administration tends to be more complex with institutional lenders and can result in draw reductions and significant delays. Problems related to draw administration are hardly unique to bank or institutional lenders, but they tend to occur less often with private lenders and when issues do occur, are more often resolved than not. The key to being able to get a Mississauga builder loan for a specific project is to work with a construction mortgage broker that has both the experience and lending sources to provide the funding you need. A well seasoned construction broker will not only help with locating funding and getting it approved, but they can be be invaluable in assisting with the draw process, especially when problems arise. If you require a Mississauga builder loan, please give me a call so I can review your requirements with you and provide builder loan options for your consideration.